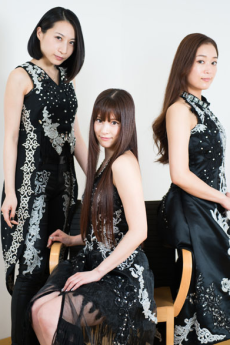 Kalafina is a Japanese band formed by composer Kajiura Yuki in 2007 to mainly perform theme songs for Kara no Kyoukai anime movies. Members: Kajiura, Yuki (Composer) Ootaki Wakana, Kubota Keiko, Masai Hikaru, Toyoshima Maya - participated only in Aria/sprinter, left the group in 2009. Main vocals and backgrounds are provided by a different member each time. For example, Wakana is in charge of the main vocals in Oblivious and Lacrimosa, while the main vocals in Aria are done by Hikaru. In others songs each of them sings a stanza. Wakana and Keiko are also members of Yuki Kajiura's FictionJunction project. Spacecraft agency officially announced disbandment on March 13, 2019 after Kajiura, Keiko and Hikaru left the agency in 2018.